Are artists to blame for gentrification? Or would SoHo, Chelsea, and Bushwick have gentrified without them? Or would SoHo, Chelsea, and Williamsburg have gentrified without them? 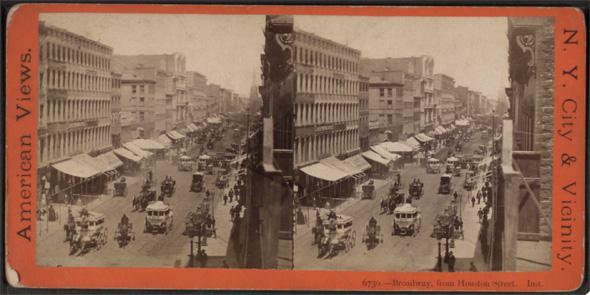 Broadway, as seen from Houston Street in New York City in 1860. The classic case of artist-led gentrification is SoHo. Wander through New York’s Chelsea art district right now, and it might not be one of the shows at the neighborhood’s increasingly overweening megagalleries that stand out. It’ll be the sheep. The gas pumps at the Getty station on 24th and 10th are half-buried in what appears to be a rolling green pasture, neatly fenced in. Clustered on the incongruous green field is a flock of loveable, sculptural sheep. It’s a bit of soft surrealism, perfect for bemused Instagramming, and could easily be mistaken for some whimsical public art installation. Except that’s not what it is, not exactly. It’s true that the sheep are by the late French sculptor Francois-Xavier Lalanne, and “Sheep Station,” as the pop-up installation is called, was executed with the help of Lalanne’s dealer, Paul Kasmin, from up the street. But the spectacle was the brainchild of Michael Shvo, once dubbed the Big Apple’s “most successful” and “most loathed” real estate broker by New York magazine. Many of these fluffy sculptures hail from his personal collection—his wife has some public Instagrams of herself reclining sexily with Lalanne sheep—as a kind of PR stunt to boost the luxury residence he plans to build on the gas station site. If you didn’t already associate art with real-estate speculation, it’s the kind of thing that’s likely to cement the idea in your mind. Right now, three conflicting crosscurrents are coming together to make this a hot topic for art-watchers and urban policy types. One is the gusto that developers like Shvo have for promoting new luxury housing via an association with art. Another is the fact that art’s role as a motor of economic vitality has become a preferred talking point for government agencies and arts nonprofits looking to justify money for culture in such challenging times. And the third factor is the angst experienced by artists themselves when they are implicated in the process of pushing out disadvantaged communities—before being priced out themselves—in places like New York’s ultra-hip Bushwick neighborhood (or, in London, Peckham, where a recent Guardian headline bluntly demanded, “Is Art to Blame for Gentrification?”). The current narrative—in newsrooms, in think tanks, in studios and galleries—has art at the bleeding edge of urban transformation. But this narrative is wrong—or at least it keeps getting told in the wrong way. The classic case of artist-led gentrification is SoHo. In the ’60s, shortly after the term gentrification was coined by British sociologist Ruth Glass, experimental art guru George Maciunus took a lead in converting the deindustrializing neighborhood’s large spaces, which had been a hub of light manufacturing for a largely Puerto Rican and African-American workforce, into artist cooperatives and live-work spaces, touching off its ultimate conversion into the gleaming nexus of air-brushed boutiques and tony restaurants that it is today. City leaders were so impressed that they wanted to do it again, and ever since the magical power of art to make over cities has been a key talking point. Schuetz does leave open the possibility that other kinds of art amenities, like museums or performing arts venues, might be better candidates to boost development. As the story often gets told, it’s not the galleries, but the young (mainly white) “creatives” who first move into an “abandoned” neighborhood (which usually just means a neighborhood where poor and minority communities live or work) and lure the more affluent behind them with their vegan restaurants and glamorously eclectic outfits. Artists—glamorous but poor, open to unconventional living conditions but also in need of copious space for studios—are viewed as some kind of natural middle-term residents between the disenfranchised and a more moneyed set. For a decade, urbanist Richard Florida has been preaching the gospel that if cities can lure the “Creative Class,” then prosperity will follow. Yet here again, causality is hotly debated—are funky bohemians the engine of development, or do cities with lots of money floating around simply tend to have funky bohemian scenes? And again, the special emphasis placed on art as a cause is misleading: Florida defined his creative class so broadly that it embraces 30 percent of the working population, including finance types and lawyers. His juicy “super-creative core,” whose proclivities were said to play the lead role in “reshaping our geography, spearheading the movement back from outlying areas to urban centers and close-in walkable suburbs,” embraced a more modest 12 percent of workers, but still included folks like scientists and techies—not exactly people living on the margins of respectable society. The familiar examples of artist-led gentrification—in New York, the East Village, or Williamsburg—are so often cited that one almost forgets the great number of Gotham neighborhoods have gentrified without an artistic assist. At the moment, Crown Heights is experiencing a wave of transformation, and bohemians are not particularly in evidence; just garden-variety, mainly white professionals. Ditto in Harlem, which is experiencing breakneck gentrification, without any particular new artistic influx. Heck, even Flushing, Queens, is gentrifying. There, Jefferson Mao argues in his wonderfully titled essay, “On Gentrification in an Unhip Place,” it is wealthy Asian immigrants doing the gentrifying. In the often-bitter narrative of neighborhood “revitalization,” much more depends on huge forces like average area incomes, social stratification, real-estate speculation, and rent policy than on the magic of art. (Even in artist-led gentrification’s relatively raw form in SoHo there were bigger city planning forces in play, including the Rockefellers’ concurrent push to renew Lower Manhattan.) That’s why the recent vogue for ham-handedly trying to rebrand declining cities as “vibrant” cultural destinations as a way of hotwiring economic development doesn’t typically work out. Since the financial crisis, Florida’s new line of thinking has been “ultimately, we can’t stop the decline of some places, and… we would be foolish to try.” That’s left unhip burgs like Elmira, N.Y.,and Roanoke, Va., which attempted to save themselves by adding artistic resources, feeling more than a bit disoriented. Florida, meanwhile, has publicly disassociated himself from initiatives directly inspired by his theory, like Michigan’s “Cool Cities” project. Without the larger pressure of economic development behind art, cities are left pushing rope. The flip side is that in places like New York, with its turbo-charged real-estate market, artists aren’t really in the driver’s seat. Even in my neighborhood, Brooklyn’s increasingly uncool and preppy Williamsburg, the spectacular transformation of the last decade has not been just some natural process of rising cachet thanks to the art scene. It’s a function of very conscious and hotly contested zoning decisions, including a far-reaching and disgraceful failure by both the city and private developers to follow through on even modest and symbolic commitments to affordable housing. “To be honest, artists are the least of our worries,” says Miguel Robles-Duran, the director of the graduate program in urban ecologies at the New School who has studied Bushwick in particular. Developers certainly seize on the presence of artists as a marketing tool, but mainly to do what they are doing anyway, which is developing. “The current system is designed to make this happen,” Robles-Duran says. And finally, it is also possible for artists to move into a neighborhood and not completely uproot the existing community. “I repudiate the notion that artists are the shock troops of gentrification,” researcher Anne Gadwa Nicodemus wrote recently; among other things, she points to her study of artist communities in St. Paul, Minn. The neighborhood, she claims, “is more racially and ethnically diverse than before the artist spaces, and, for better or worse, still has quite high poverty levels.” In Bushwick, Robles-Duran and his collaborators plan to put out a bilingual Spanish-English gazette to publicize their research on the area’s housing problems and to try to draw together the community to save the neighborhood from rapacious redevelopment—though, with even the artists now being pressured out, the hour seems late. Artists are a particularly self-conscious, sometimes self-indulgent, and always exhibitionistic community—they exist to call attention to themselves—so it makes perfect sense that they draw disproportionate notice in the gentrification debate. Some emphasis on their role probably reflects a healthy political self-awareness; but we need to break out of the conversation about the role of art to look at the problem constructively. Until there’s some understanding that gentrification isn’t just about people’s individual lifestyle choices—of artists, or preppies—but a symptom of dysfunctional urban policy, everyone is going to continue to get herded in front of rising rents every few years. Like sheep.